DALLAS, TX ( January 16, 2006 ) Grand American Series Cup driver Matt Mullins announced today that Skinny Cow Milk will sponsor his BMW entry in the Grand Am Cup opener at Daytona International Speedway, January 26th - 29th. Mullins will join well-known Automatic Racing, and owner/driver Jep Thornton, for the Daytona event, who will supply him with the Skinny Cow Milk BMW M3. The sponsorship is the first for Skinny Cow Milk, which is produced and marketed by Dean Foods, the largest distributor of milk in the nation. Skinny Cow, a Dreyer’s brand, is well known for producing a line-up of ice cream products, and boasts making a healthy life a happy one. “We understand the power of motorsports marketing, and look forward to delivering a marketing program with Matt through the Grand Am Cup series that will add value to our retail customers” stated Tom Murrin, Vice President of Private Label sales for Dean Foods. Matt Mullins is a full time Driving Instructor at the BMW Performance Driving School in Spartanburg, SC. Additionally, Mullins has been a stunt driver in commercials and movies with the most recent being the Will Ferrell NASCAR feature with the working title “High, Wide, and Handsome” due for release in the summer. He also has a recurring professional driver role in a series of comparison videos for MINI. Mullins began racing in 1990 and has experience in a wide range of cars. He started out in the Russell Formula Mazda series and has performed in various NASCAR racing series, including the NASCAR Winston Late Model Series, the NASCAR Sportsman Superspeedway Series, the ARCA RE/MAX Series and the NASCAR Craftsman Truck Series. In 2000, he ran a limited schedule with BAM Racing and Midgley Motorsports, and in 2002 he returned to national competition in the NASCAR Craftsman Truck Series, driving a truck owned by Daytona 500 winner and Fox TV analyst Derrike Cope. In the Daytona opener Matt drove Dean Foods’ Folger’s Jakada truck, finishing 16th in his inaugural Truck Series run. 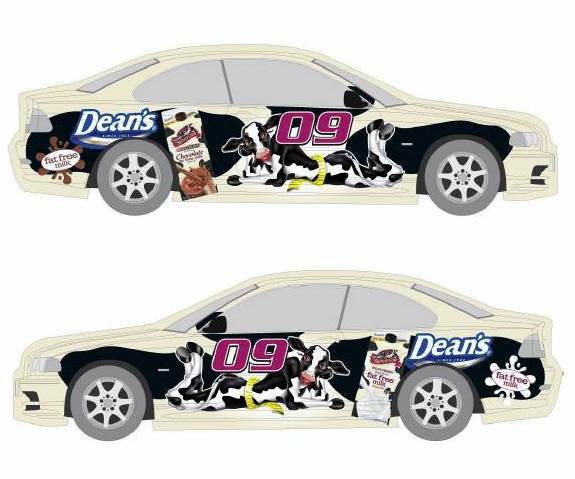 Beginning on Thursday January 26th, both chocolate and regular Skinny Cow Milk will be available in the Grand Am Paddock Club, for the over 700 race team members, owners, and guests, to enjoy throughout the Daytona race weekend. Skinny Cow is the milk and ice cream that makes your healthy life a whole lot happier with a rich and creamy taste that is unlike other low-fat brands. A full variety of flavors can be enjoyed in ice cream sandwiches, ice cream bars and sundaes. Skinny Cow offers no sugar added and carb-friendly versions of their products and can be found at stores nationwide. Dean Foods is the largest processor and distributor of milk and other dairy products in the country and also one of the leading food and beverage companies in the US. Through their WhiteWave Foods division, they are also the nation's leading manufacturer of soymilk, organic milk and other organic foods. Dean operates more than 110 plants in the United States, Spain, Portugal and Great Britain, and employs more than 26,000 people.